Sara is the founder of S & E Trusted Online Directories Inc and she came up with the Trusted concept. An immigrant from the UK and she brings over 20 years advertising sales & marketing experience to Trusted. In 2011 she took the leap of faith and started S & E Trusted Online Directories Inc. with the intention of creating something special and consumer-focused to local online search, she definitely succeeded as 4 years later trustedsaskatoon.com and trustedregina.com are becoming household names! Sara is passionate about promoting local businesses run with integrity and is very involved in the communities she does business in. She invests a great deal of time and money supporting local events, non-profits, entrepreneurs and individuals in need. In 2014 she expanded Trusted's services and launching Trusted Marketing Services a full-service marketing agency, so she could help small to medium local businesses with all of their marketing. Sara is an extrovert and is regularly invited to present on marketing, business and entrepreneurship. In her limited spare time, you'll find her travelling as much as possible, running around after her 3 children, listening to live music, cooking, golfing and spending quality time with friends (normally wine is involved). Sara is the recipient of the 2017 NEYA Growth Award, 2017 ABEX Community Involvement Award, 2 Bronze International Stevie 2014 Women In Business Awards, the 2014 Regina YWCA Women Of Distinction Entrepreneur Award, Saskatoon Chamber 2014 SABEX AWARD for Marketing excellence and the Saskatchewan Chamber Of Commerce 2014 ABEX Award for Marketing. Anna Maton has always had the drive and ambition to support and promote the clients she has worked with over the past thirteen years. She has worked in a variety of industries including construction, marketing, recreational, event planning, sales, non-profit and customer service. She has always valued the importance of building relationships with everyone that she crosses paths with and loves to network. She is known for going above and beyond for the clients and loves to work with them to come up with new and exciting ideas to support their success. As a mother of two, she finds she learns a lot from her children as they are both very creative. Her son has a heart condition so she volunteers her time and sits on the board of directors for the Little Hearts Family Group as well as supports the Mending Little Hearts Fund of Saskatchewan. When she can she loves to spend time with friends and family, painting and being outside. She also loves great food, beer and gin! 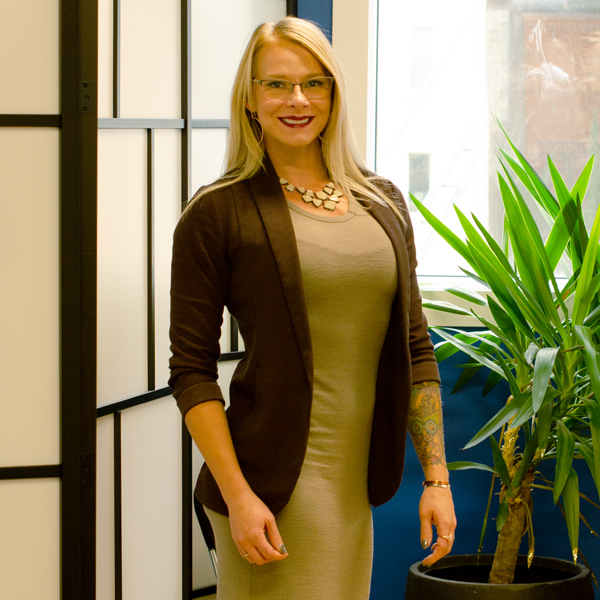 Anna is excited to be part of the Trusted Team and to be able to apply her full skill set to help her clients. Victoria graduated from Saskatchewan Polytechnic with a Diploma in Computer System Technology in 2014. This was a natural path to take for her as she always had a passion for technology and loved exploring any new program or technology that she could get her hands on. This is what lead her to excel in Computer Software which she demonstrated by placing second in the 15th Saskatchewan skill competition in the IT-Software Solution for Business Division. When not playing around with technology she has had a long involvement with the Girl Guides of Canada ( she has the 25-year pin! ), where she currently works with girls 9 -11years of age. When she's not busy with all that she is at home relaxing with cat Ivy. Oh, she is also visually impaired but it never slowed her down as you can see. Ally is committed to helping people succeed and be their best in all they do. After a 14-year career in the medical field, she was looking for a change and she was drawn to the Trusted brand. Ally has a history in sales and retail management, as well as pursuing personal and family-based business ventures. Together with her husband, Ally has two adorable young daughters whom she accredits her renewed sense of wonder and learning. Ally is proudly Saskatoon-born and bred, she has a strong sense of local and supporting small business in the city she loves. Ally has a creative energy and enjoys reading and painting when she finds a free moment but her main passion is in fitness. Ally started actively bodybuilding after the birth of her first daughter and has since gone on to win both regionally and provincially in her Figure category. "Hi, I've just move to Saskatoon and I have bought a fixer-upper home. Having no contacts here I knew here that I would be taking a gamble on which trades people I used, so I'm very happy to have found your website-thank you so much." As a Trusted partner I, of course, go to Trusted first when I am looking for a service or business to meet my needs. In May I moved so the first place I looked for my movers was on Trusted Saskatoon. Two companies came up and I immediately contacted both for quotes along with other companies that were not on Trusted. The two companies on Trusted were the only ones that responded to my request for a quote. They were very similar in what they offered and price so I selected one and my experience was great. The owner of the company was calling the guys during our move to check in and see how things were going, they were on time, the cost was what was quoted and there was not one nick in any walls. I was very satisfied with my experience. Once we had possession of our house it was clear we needed the carpets cleaned badly. So again I went to Trusted and found Hal at the Carpet Guys. This is the second time I have reached out to Hal through Trusted. He is great. He fit me in, he is fast, and he does a fantastic job. I have recommended him to others several times. As a Trusted partner it was great to experience it from the other side. I know the process a business goes through to be a Trusted partner, I know the work Sara and her team do to make sure each company can be “Trusted” and that makes the decision of who to call so much easier. If a company is on Trusted I don’t feel the need to ask friends for recommendations or try to find out about other people’s experiences, that work has been done for me. If you are a Trusted partner why wouldn’t you reach out to the other partners for their services and products first? It just makes sense!